Think about a customer that comes in asking for some of your traditional, fastest moving parts. They’ve made your job easy because all you have to do is look up the part, availability, and location, and the customer is on their way. The same, however, cannot always be said for your service department. When a customer brings a unit in for service, the tech must first evaluate the unit and then determine what parts are needed. Some are a relatively easy fix. Others, however, take more time and research in both diagnosing the problem and locating some of your lower volume parts. When more research and special ordering is involved, this whole process has just doubled if not tripled your time and resources. To maintain a profitable service department, it’s essential to reduce some of the costs involved. Ideal Computer Systems and Clements have worked to help simplify this process with a new price markup feature. When utilized properly, any markup in the Ideal software is automatically applied to work orders which, in turn, keeps the service department consistent in their pricing and opens up the door for some significant profit-generating opportunities. 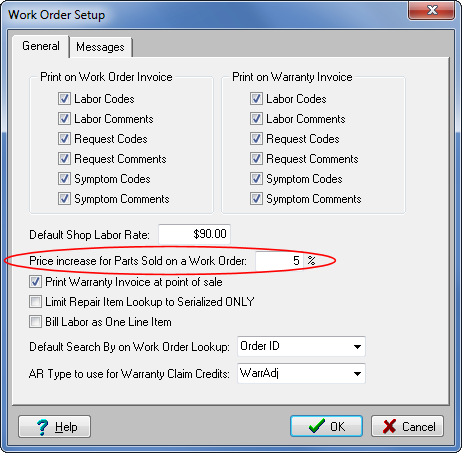 Under Price increase for Parts Sold on a Work Order, enter your desired amount.